There are two size options in the range: CT166 (16' long, 6'6" wide) and CT167 (16' long, 7'6" wide). Both models offer a maximum gross weight of 3500kg. Tilt is achieved through the use of a manual hydraulic pump. 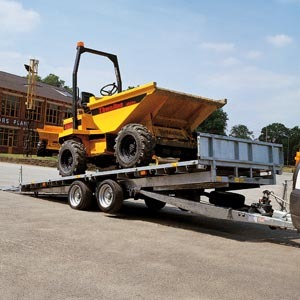 The low tilt angle (approximately 12 degrees) and drop-down tail ramp make it easier to drive almost any kind of wheeled vehicle onto the trailer bed. A longer (3') loading ramp is available as an option. Tough, adaptable and easy to maintain, all models are fitted with a tough resin-coated plywood platform as standard. An option of aluminium treadplate covering is available, along with recessed lashing rings. Trailers can be further enhanced by the fitment of accessories such as dropsides, headboard, ladder rack or meshside extensions.